The medical implants market is a large market with implants for various applications. As the world population is ageing, the prevalence of age related degenerating diseases is increasing. As per World Health Organization (WHO), the number of people aged 60 years & above will rise to 1.4 billion by 2030. Due to increase in the geriatric population & improved life expectancy, the number of age related diseases has also increased. This is the major contributor to the increased demand of the medical implant devices. The devices can be of permanent or temporary nature depending on the application. The medical implants can be categorised based on the application into orthopaedic, cardiovascular, ocular, dental and others. These implants can be made of different raw materials such as metals and its alloys, ceramics, polymers, biologicals and others. The market analysis includes an in-depth examination of the key ecosystem players and key strategies & developments taking place in this market. Additionally, it includes market dynamics (market drivers, opportunities and challenges) and industry analysis. The purpose of the study is to gain a holistic view of the next generation implants market in terms of various factors influencing it such as recent trends, technological advancements, and regulatory aspects of the market. The scope of this report is centred upon conducting a detailed study of the solutions allied with the medical implants market. The market has been segmented by ‘application’, ‘raw material’ and ‘geographical regions’. The report presents the reader with an opportunity to unlock comprehensive insights with respect to the market and helps in forming well informed strategic decisions. The research uncovers some of the substantial parameters that must be taken into consideration before entering into the market. 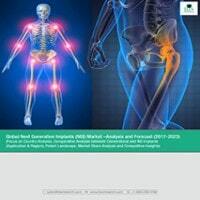 This research report aims at answering various aspects of the global next generation implants market with the help of key factors driving the market, threats that can possibly inhibit the overall market growth, emergence of next generation of implants and the current growth opportunities that are going to shape the future trajectory of the market expansion. The study considers the growth-share matrix model for a comprehensive study of the global next generation implants market and assesses the factors governing the same. • What are the major market drivers, challenges and opportunities in the global next generation implants market and their case studies? • How the medical implants market evolve and what is its scope in the future? • What is the market share of the leading segments and sub-segments of the global next generation implants market in 2016 and 2023? • How will each segment of the global next generation implants market grow during the forecast period and what will be the revenue generated by each of the segments by the end of 2023? • What will be the growth rate of different segments during the forecast period? Which is the leading segment by application and raw material used? • Who are the key players for the next generation of implants market? • Which geographical location will dominate the next generation implants market? The key players which have significant contributions to the biologics drug discovery market are Smith & Nephew plc, Orthofix Holdings, Inc. Medtronic Public Limited Company, LivaNova PLC, Edwards Lifesciences Corporation, Globus Medical Inc., Johnson & Johnson and Zimmer Biomet Holdings Inc. among others. 9.5. C. R. BARD, INC.
9.25 W. L. Gore & Associates, Inc.
18 Cardiac Devices Used in U.S.
19 Arthroplasty Procedures in U.S.
35 Overview: C. R. BARD, INC.
37 Overview: DENTSPLY SIRONA Inc.
40 Overview: Globus Medical Inc.
42 Overview: Integra LifeSciences Corporation. 45 Overview: LifeNet Health, Inc.
50 Overview: Orthofix Holdings, Inc.
55 Overview: W. L. Gore & Associates, Inc.
As the world population is ageing, the prevalence of age related degenerating diseases is increasing. As per World Health Organization (WHO), the number of people aged 60 years & above will rise to 1.4 billion by 2030. Due to this increase in the geriatric population & improved life expectancy, the number of age related diseases has also increased. This is the major contributor to the increased demand of the medical implant devices. Medical implants are devices that are used to insert or graft into a patient’s body to function as a part or whole organ. As per U.S. FDA, an implant can be defined as a device or tissue that can be placed inside or on the surface of the body. These devices provide support to the existing organs or replace them or substitute the missing parts. Some implants are permanent in nature & stay lifelong in the patient’s body while others may be temporary. The permanent implants include stents, pacemakers, heart valves etc. Temporary implants are removed when no longer needed such as screws. Some of these provide structural & functional support such as cardiac valves, and joint replacement implants, while others can be life sustaining systems such as implantable pacemakers & defibrillators. The younger population is also a consumer group of these implants due to lifestyle changes. The increased prevalence of obesity, physical inactiveness, and increased consumption of fast food are also contributors to such diseases & hence add to the demand of implant devices. The purpose of the study is to gain a holistic view of the global medical implants market in terms of various factors influencing it such as recent trends, technological advancements, and regulatory aspects of the market. The scope of this report is centred upon conducting a detailed study of the solutions allied with the medical implants market including conventional and next generation implants. The market has been segmented into ‘application’, ‘raw material’ and ‘geographical regions’. The global next generation implants market is estimated to grow over $3.9 billion by 2023. On the other hand, the conventional implants market is estimated to grow over $103 billion in 2023. On the basis of application, the market is segmented into orthopedic, cardiovascular, dental, ocular and other implants. As per the raw material, the metals and its alloys are dominating the conventional implants market with an estimated value of $25 billion in 2016. North America was estimated to be the leader in 2016 in conventional implants with a market value of $30 billion in 2016 mainly due to rising geriatric population and increased prevalence of diseases. The fastest growing market is expected to Asia Pacific with a CAGR of 8.7% from 2017 to 2023. The market is strongly driven by the technological advancement & evolution of implants. The use of better materials, automated surgeries, biological materials, personalised implants, better care, and decreased risk of infection are contributing to increased patients’ and physicians’ interest in the market. The report provides in-depth SWOT analysis of different key players of the market, supported by extensive financial summary of each. Some of the key players are Abbott Laboratories, Smith & Nephew plc, Boston Scientific Corporation, Johnson & Johnson, Medtronic Public Limited Company, Wright Medical Group N.V, C.R.Bard, INC., Stryker Corporation, Globus Medical Inc., DENTSPLY SIRONA Inc., and Zimmer Biomet Holdings Inc among others.